I apologise to anyone who follows me and occasionally drops by to see what I am up to. I appear to be failing with posts and the reason is that I haven't done anything creative for some time now. I don't think I allowed myself a rest after finishing the degree and have gone straight into working. Bradford College have asked me to submit some pieces to be exhibited at the Knit & Stitch in Harrogate, so hopefully this is the kick up the backside I need! See you soon and I hope you will be back. Just to let you know the company I work for have this week launched a new Blog as above. It is to share new designs, trends and yarns. So if you know anyone who loves knitting from your mum, dad, auntie, sister, whoever you know please pass this link on to them. I would like to wish Fiona Wilson http://www.fiona-wilson.blogspot.com/ and Dionne Swift http://dionneswift.co.uk/bm/news_exhibitions/index.shtml a super event at the Knit and Stitch in London. Sorry I cant make it down ladies but hope you have a great time (and sells lots of your lovely beautiful work). It was lovely meeting people over the past 2 previous weekends at Radiant Works in Huddersfield. A big thank you to everyone who made it. Now its time to get myself organised and start the Sketchbook Project. My theme is "if you lived here" which I will be basing on the house I live in which was built n 1860. A lovely cream page tempts me to be creative! Bit of stitching - Cornish landscape. Work in progress with lots to do this week. In preparation for the following two weekends. My cards (packs of 5) are based on the Cornish Landscape and lavender in Provence. Diary dates - 18th/19th and 25th/26th September. HOST open studios. Really looking forward to the HOST open studios and also to meeting lots of people visiting Radiant Works. Links below of full details for Dionne Swift, Fiona Wilson, Kerry Mosley and Julie Ann Seaman and myself of where to find us plus details on the website of all other artists. This is a fantastic event and we look forward to seeing you all. School Holidays and failed blogging! Failed with posts recently. The holiday in Cornwall was lovely - not as much sketching done as I would have liked, but a few ideas flowing. Have opened my box from Dionne Swift but being at home and the school holidays there always seems something else to do! Frustrating - however from next week I need to get back into a routine and be disciplined. This was bound to be challenging after studying for a few years and being in a creative environment, so now it is vital to get organised and create that space and time for myself. Yesterday I had a newsletter from Dionne Swift and immediately ordered one of her new Colouration Kits - http://dionneswift.blogspot.com/2010/08/colouration-kit.html. Everything you need in one package with instructions. She has various kits to buy and being a typical textile person I will be very excited when the parcel arrives! 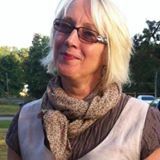 As always Amelia Critchlow's blog http://101birdtales.blogspot.com/ is fun, informative and inspiring. 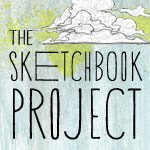 Look for the link to the Sketchbook Project which I, and my friend Fiona Wilson, have signed up to. I think it will be exciting to be part of a large project across the sea (so to speak). Just been to Provence for 10 days and it was wonderful. I only did two sketches and felt quite guilty, but then realised that I actually needed a rest as four years of hard work has just ended! So I am back and searching for a suitable job/opening. A few interviews in the pipeline this week which is good and I am also in the process of de-cluttering at home which is necessary to move forward. A changing time but also daunting. Here I am a graduate looking for a new experience, now having to think for myself with no prompting from tutors. It is exciting, scary and I have to be self-disciplined with my own design work at home - here I go! Thank you to all my family and friends who came last night and supported me (and everyone else). It was a lovely evening and I met lots of new people as well. It was very busy and I didn't get a chance to look around the rest of the show but I will next week. Textiles and HNC were together in the studio and it co-ordinated extremely well - some wonderful work. The show is up for another week until we take down the items picked to go to New Designers, it will be interesting to see what does get picked and I guess it is a hard task for the tutors deciding what will coordinate best in our space in London. Another exciting week. Today is the Degree Show Preview 4.30 - 9.00pm at Bradford School of Arts and Media Its very exciting and there are lots of wonderful designs/collections for people to see in all departments textiles/fashion/printmaking/fine art/graphics. This is my final collection and I look forward to seeing family and friends tonight - if anyone cannot make it they have a week left, see the link above for times etc. I am very excited about it! Will upload photographs shortly. I was first up this morning for my 15 minute critical assessment. Sitting and listening were our tutors Gill Craven, Tami Stewart and Andrea Wilde (unfortunately Hannah could not come in today). I think it went well - I managed the full 15 minutes but its always a bit of a daze. I spent quite a bit of time writing and reading it to ensure I had covered all points - however you always remember something about 10 minutes after you have left the room. The exciting bit now is the Degree Show next week (look at Bradford School of Arts & Media website) and then New Designers Show in London. I feel very lucky that I was able to do this degree and have met some fabulous people. Feeling happy but a little bit sad. Ok - my last post looked like I was just sat having fun in the garden! The reality is I am tired beyond belief - average bed time between 12.30 - 2.30 each night up again 6.45 ish most days. I am working so hard I would love not to have to have any sleep whatsoever so I could do more work. I have done my absolute best but feel that given time I could do even better. I see that as a positive development. I have had washing on the line for over 5 days (no one else in the family has noticed) - although to be fair my husband has done all the washing and ironing in the Utility. I have enjoyed my development and met some great tutors & technicians at Bradford college. I feel that I am a textile artist now and not someone who does crafty things. I have survived and looking forward to handing in, assessment, degree show and new designers. I have been working since 7.30 this morning and going to bed now at 11.30pm. Doing this over a long period catches up with you - this week will be tying up all the loose ends, putting up my collection space in preparation for Assessment this coming Thursday and the Degree show starting 17th June. Have done a lot of stitching this weekend and managed to find a little peace in the garden yesterday for about an hour. I am very lucky with our garden - no traffic noise so it really is lovely when the sun is shining (or any other day for that matter). Well it can be anything you want it to be. I am telling the story of when I visited the Gregynog Press and the connection I felt - "The Embroiderer meets the Press". One of my books is this small vintage spool with digital print stitched onto vintage ribbon. The words telling the story, unfolding as you unwind the spool. It is a hectic time so not a lot of posts! Postcards and business cards (above) were printed today and self-promotion boards to do tomorrow. Finishing off all printing required and the last slog of technical notes (which takes a very long time). I am in the process of creating two covers for textile art books and all the embroideries which are to be captured within them (doesn't sound much when you write it down.....) I am tired but I must say really enjoying the last few weeks of this degree process. Its 22.46 and I was up at 6.15 this morning and still working. We have been given our spaces for the college degree show and I am getting excited - reality is lots more work to do before then. Keep you posted and photographs to follow. Regarding exposing of screens and the drama - discovery today was that half of the bulbs had gone in the exposing unit. So it wasn't me................................ Poor Ian and all the hard work involved but you couldn't tell until the unit was actually opened. A good day today as I have finally finished setting my typography, results will be shown in a few days. I need to prepare all my lovely paper, order binding materials and get on with making my book covers - oh and lots of embroidery. I am just beginning to appreciate what I have actually learnt in my 4 years at Bradford College and how much it has changed my work from simple hobby craft to thinking wider and being an artist. It has being very emotional (friends will testify to that!) and tiring but also exciting. Keep focused, keep ticking off the "to do list" and I aim to enjoy my last few weeks of finishing my final collection. I just thought I would say......................... I love embroidery. It has been a crazy week - very busy in the print room and finally got my last two designs onto screen. If anyone was jinxed on the screen development front it was me. My "boxes" design is hand drawn and very small boxes (monotype casting) and finally after the 4th attempt exposed correctly - not sure what went wrong as it came out in different patches on different screens! Poor Ian (in Print Room) will have had enough of me by the time I leave - a last resort was to get it exposed in the Printmaking Department (thank you Helen Wood). Will show all the results in a few days. My other screen is "scratched surfaces" taken from a drawing of the Greygnog Press floor, but also inspired by the scratches on all the lovely machinery. It has been a week of printing samples in different colours with my new fabrics and I am very happy with the results. Just ordered more fabric as I need to print two 3 metres lengths from two designs. The photo shoot was today for self-promotion and I was nervous - but also tired as days have been very long this week (what's new?) so I admit to be rather hyper (hysterical..... whatever.....). Anyway thanks to Hannah Lamb my tutor for giving advice on positioning for photography. So it is another tick off the list. Because of all the hard work put in this week I finally see some of the end results I want. That isn't to say the "to do" list is nearing its end but I am beginning to get excited about the degree show and New Designers (she says with a very large glass of wine in her hand............................). Happy weekend. Had a wonderful relaxing day on Saturday with my good friend Fiona Wilson. We attended a workshop for basic book binding in Wakefield by Victoria Lucas. We made 3 books - concertina (hard back), Japanese stab binding and a hard back book. I can read lots of instructions but there is nothing like actually attending a workshop and seeing the procedure. Everyone learns in different way, I guess I am more tactile. This has helped me enormously with ideas of how to bind together my final collection of papers etc. My hard back book wasn't perfect by any stretch of the imagination but it highlighted to me the skills required to be a good book binder and why the apprenticeship is 7 years. It takes organisation, precision, patience and importantly - time. Learning new skills is always exciting and all the better to be joined by a friend - and if your lucky you meet new ones along the way. A sneaky peak at my studio space, obviously lots of drawers full of drawings etc you can't see! I am lucky to share a space (next to my desk) with Sue Geldeard who has travelled this degree journey with me. On Friday we went down to London for the New Designers Prepare day. It was a lot to take in but interesting none the less. 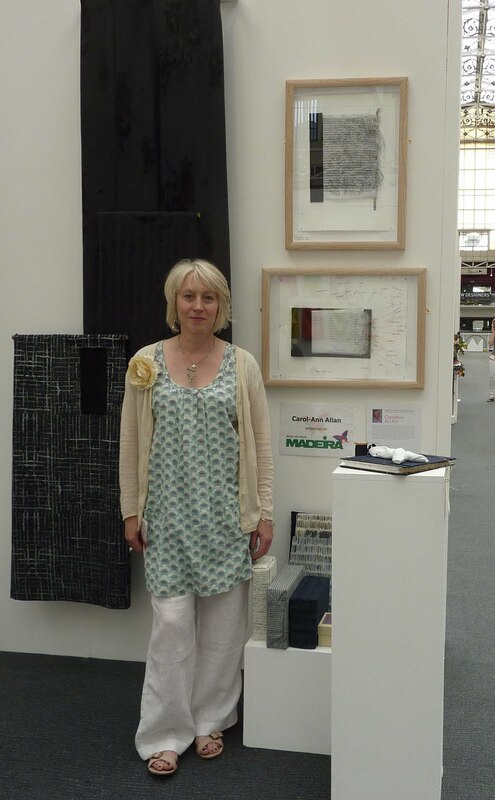 However it did make us realise what little time we have left until we are exhibiting there between 1st-4th July. This week has been strange - lots planned and never enough time. I do have a schedule of things to achieve etc but you can never account for the time it takes to print out acetates, developing new screens (and redoing them when for whatever reason they have not turned out!). On the good side I now have my new lovely linen fabrics (www.fabrix.org.uk) and once I get all my 5 repeat designs finalised on to screens I will be printing in lots of colourways. Have spent quite a lot of time in the printmaking department with the help of Barry and Brian Hindmarch (Graphics tutor) typesetting - It is very relaxing and I could quite easily spent a lot of time in this department. I have managed to complete some dry point samples but still have a lot of work to achieve the results I require. Next week I need to schedule time to start my embroidery samples. My Mantra - keep positive, stay calm (!) and take one week at a time - I LIVE IN HOPE. What a week I have had! My repeat pattern was incorrect but I didn't really discover it until the second day as I was busily printing different colours testing my dyes. When I went to test the repeat design realised a mistake had been made. Thankfully help was at hand and Ian Gilmour (Print Room expert!) helped me solve the problem. I had made 2 mistakes on different screens. It is sometimes true that you become slightly blind to faults when you work on something for a long time and therefore you should take a break/step back and come back to it. I also placed an acetate the wrong way round when exposing a screen and my 'words' came out in reverse - New Screen. I then dropped the screen after printing (because it is rather large) and ripped it - New Screen! In total I have had 7 screens instead of 3! Big thanks to Ian for his patience. You can't see the design very clearly but it represents the lines/story across the pages of a book. It is printed on cotton for sample purposes but the finished results will be on linen. All in all it was a good idea to come into college during the break and I have had the time to solve all these problems so I can start a fresh next week. Have been up very early this morning and written down all the words spinning around in my head. Design development has been taken into two new printing screens this week. 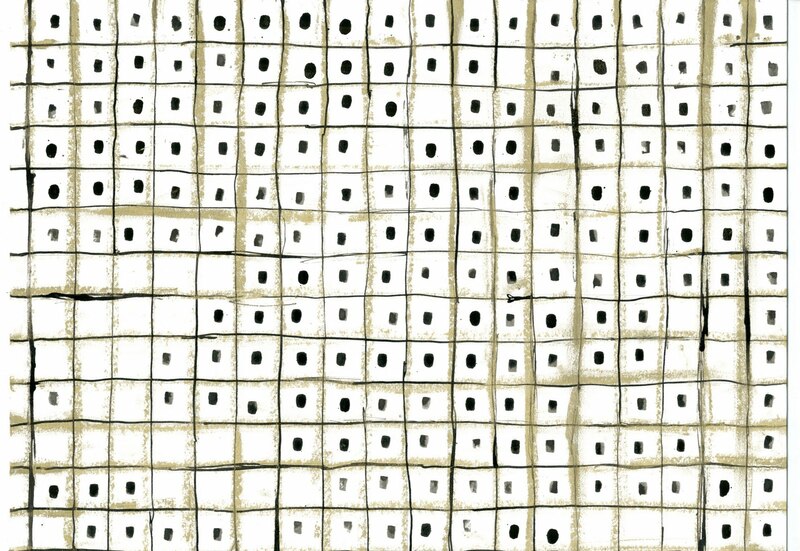 One from hand drawn grids - inspiration from the composition matrices (boxes of fonts!) and the other from lines of words. These will be for domestic interiors. The other side of my collection is my textile art pieces and textile books. One small book will be wrapped around a cotton reel entitled The Embroiderer Meets the Press and you will have to wait and see once finished! There will also be another small linen book both encased in a box representing the "composition matrices". We have a break for 2 weeks from college and my "to do" list is vast, but it is a good time to catch up with templates for embossing, research for files, fabrics and paper. Plus ............... to finish my dissertation to be handed in when we get back to college. So it is busy but really exciting as well. Happy Easter. Have been up to Edinburgh for 2 days with my family - the trip was organised so that I could visit the above at the Dovecote Gallery. My husband's family came from Edinburgh so it was nice to go back up there, unfortunately no family left but we managed to visit his granny's house and took a picture of our youngest daughter outside it. She is named after her so we were re-creating a photo. The exhibition was worth the trip, my favourite was Matthew Harris but each section was interesting in its own merit. My oldest daughter sat for over an hour knitting a square - she is still learning and left handed which is a challenge teaching her. My other daughter has less patience so made a bow from wool and added to "The Making of Garland", however she did enjoy Amy Houghton's typewriter and left a message. The morning left me feeling very calm and I enjoyed the time with my daugthers "experiencing" the exhibition. It also gave me lots to think about for my dissertation so I really need to get on and do the work now! 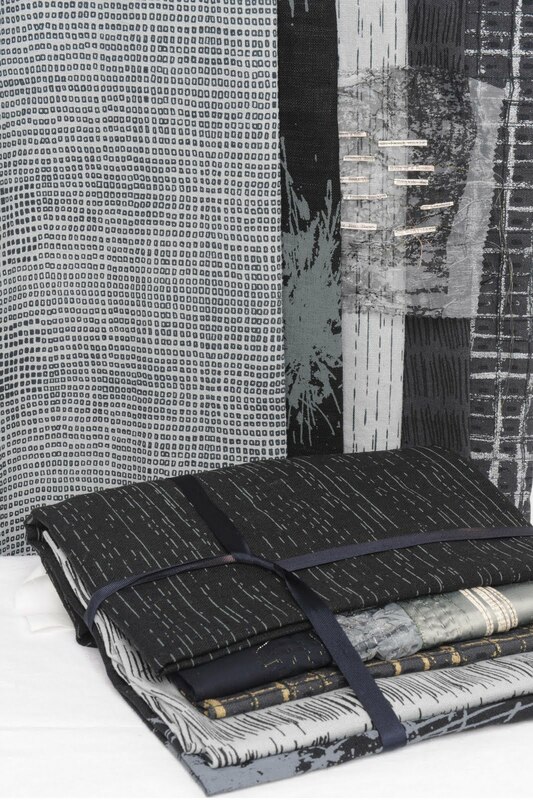 Will be pushing forward with my Shreds of Evidence and have been researching book binding, printing press (visiting a Book Binding company in Huddersfield on Tuesday) and quilting for my textile art book. I would also like to show that I can produce surface pattern within this and tell the story of traditions in the printing industry. I've been to some wonderful exhibitions over the past two weeks. The Sashiko Exhibition has finished at York now but it was amazing. Dionne Swift at the Bankfield in Halifax wonderful and I urge people to go see it. Taking the time to go see exhibitions is so important, personally I feel it makes you think more in depth what you can do with your own work. We all take inspiration from different things, surroundings and also from other peoples work - obviously in a positive way, even a simple stitch can lead to great thoughts of interpretation. It kick starts an idea that you had but was stored at the back of your brain, that is why I feel blogs/diaries are such a good way of exploring how you feel and taking work forward. A discussion in your head - typed out to clarify things! Well I did it - with a little help with Sylvia in the Fashion/Textile workshop and a few fashion students! They were a great help the days my tutor Hannah wasnt in. It was certainly a challenge taking apart a man's shirt and making it into a womans, I now have great respect for all those shirt makers out there! The interesting thing was not to be defeated really, there is always someone you can ask (or google for that matter!). Problems like the collar shrinking due to printing the fabric! Little things can appear very challenging until you ask for advice and someone shows you how to do it and it wasnt so difficult after all. I am really pleased with the shirt and the attached apron as it fits in with my Shreds of Evidence project. Finished photo here. It is actually too big for my daughter so she wasnt comfortable wearing it so I will post another photo soon showing it off better really. The stained cuffs represent the ink stains of the job working within a print environment, the back of the shirt is still unprinted as I wanted to show the back "clean" and the front as the working part of the shirt. Crit last week went well. Although you have the words in your head once you start talking you forget to say things which is very annoying! Its always a lot of hard work getting everything organised and boards completed but I was really pleased at the end of it all. Need to catch up of my sleep now though. The general opinion was that I carry on with my Shreds of Evidence theme. I think because it is so different to what I normally do it will challenge me and the idea of a textile book which lead me on to book binding, quilting etc so new skills to learn. Its such a relief when all the files/sketchbooks are handed in but there is also the little nagging doubt in the back of your head - if only I had more time I could have done more work! We have a week away from college now so I am hoping to see a few exhibitions, Dionne Swift at the Bankfield, Japanese Sashiko Textiles at the York Art Gallery and Rob Ryan at the Yorkshire Sculpture Park. I may in a few weeks try get to the Slow Movement exhibition in Edinburgh as I unfortunately missed it in Birmingham. I need to get organised! Next week is our crit and presentation of our two projects we are currently running. Mine are Shreds of Evidence - Print and its machinery and Blodeuwedd - The Flower Bride. I've been busy doing lots of embroidery samples having completed alot of printing before Christmas. here is a peak of some samples. Blodeuwedd - very floral obviously, cut work and lots of stitching. Shreds is machinery colours, blacks, greys etc and metallic threads symbolising the words running the books, newspapers. If I continue with this one I need quilting materials to get the precision required. We shall see!